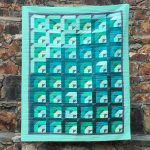 Minky….. when someone says they have a minky (or cuddle) backed quilt for me to bind it evokes the emotions of joy and fear all at once. It is such a fuzzy, soft, cuddly, wonderful material, but at the same time it is SUCH a beast to work with if you don’t set yourself up for success. There is a reason some long arm quilters charge more for a minky as it does require more of a gentle hand and care. If it is pulled too tight, the back ends up being tighter than the front and bunching occurs in the quilt top. If it is not pulled tight enough, the backing ends up bump and loose. 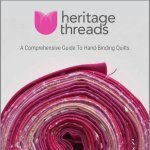 It is a lot like Goldilocks and the Three Bears, you have to treat it *just* right in all steps of the quilting process, including binding prep. First, not all minky is created equally. We all love the stuff you can buy at big box stores because it is so much cheaper and often purchased with a coupon, bringing the cost down even more. If you are planning on hand binding your quilt, do not use this kind. It is like pulling a needle through plastic. You will cause so much hand fatigue and it will take you three times as long to finish your hand binding. 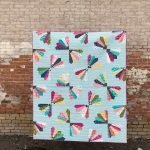 The minky (or Cuddle as it is known) made by Shannon Fabrics is the kind you want to use for quilts that will require hand binding. (This is not sponsored, they don’t even know who I am). The needle glides through it like butter. 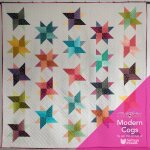 It still takes a little bit longer to bind than a quilt backed in cotton or flannel, but it is worth the extra expense to save yourself grief in the binding process. 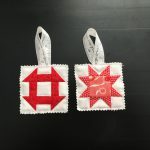 Once you are at the point that you are ready to bind a quilt that is backed in minky (or cuddle), trim the excess of leaving about 1″ of backing and batting. It is imperative that you leave the basting stitch provided by the quilter around the edge. 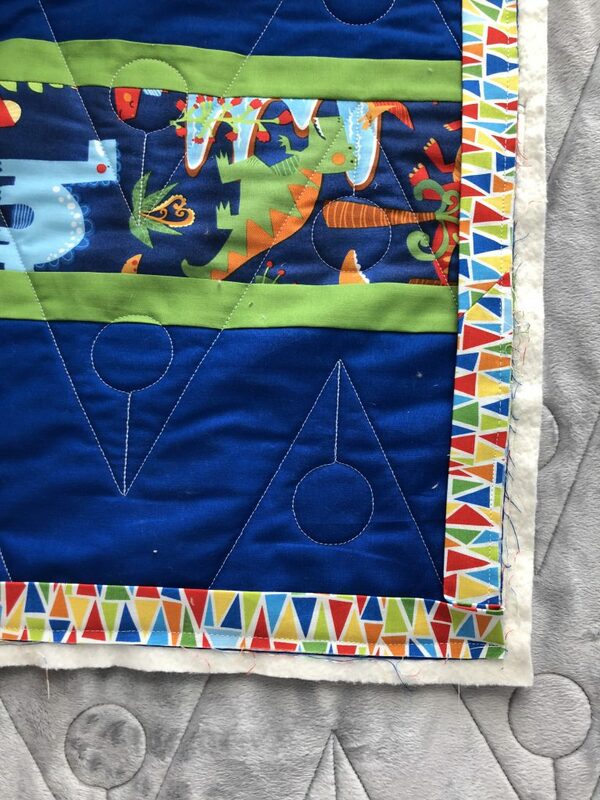 If you trim this off and trim your quilt top to size, the minky will try to sneak back under the quilt as you are attaching your binding in prep for hand work. Next, attach your prepped binding along the edge of the quilt. 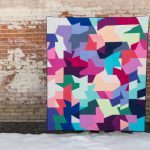 If the quilt top is not very square, try your best to make it so. If it doesn’t bother you, then follow the edge of the quilt top. You are the boss. If you care about it being square, awesome! If you don’t, awesome! Do everything as you would normally do when attaching binding, like mitering corners, etc. 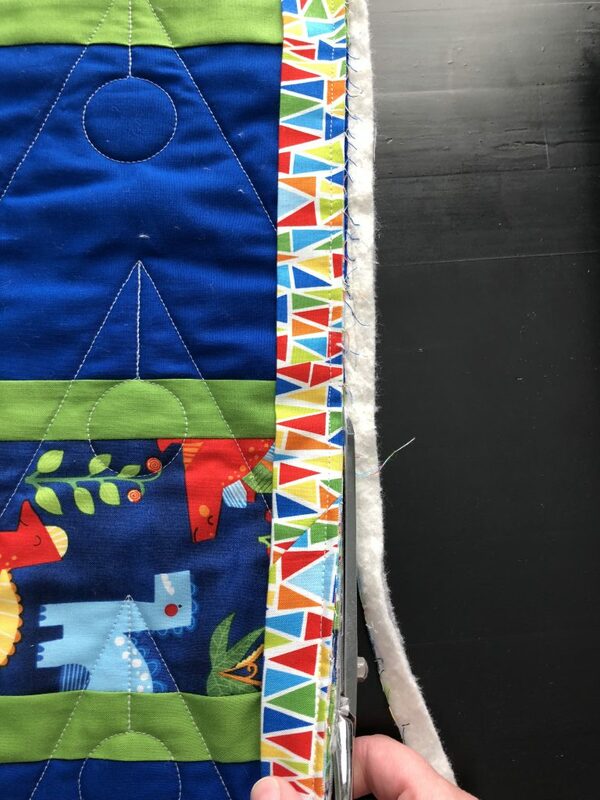 Once you have attached your binding along the whole edge of the quilt, grab your fabric scissors and ever so carefully trim along the edge of the binding. This will help your binding to go significantly easier than if you had trimmed your quilt before attaching binding. I cannot say how much easier this method is enough! It truly is. If you need help with binding technique, how to make binding continuous around the edge (so you can’t tell when it starts or stops), how to mitre corners, etc. there are lots of awesome internet tutorials. If you don’t want to scour the internet finding them, my Comprehensive Guide to Hand Binding Quilts is up in my Etsy and Craftsy shops, complete with lots of step-by-step photos walking you through the whole process. What a great suggestion! 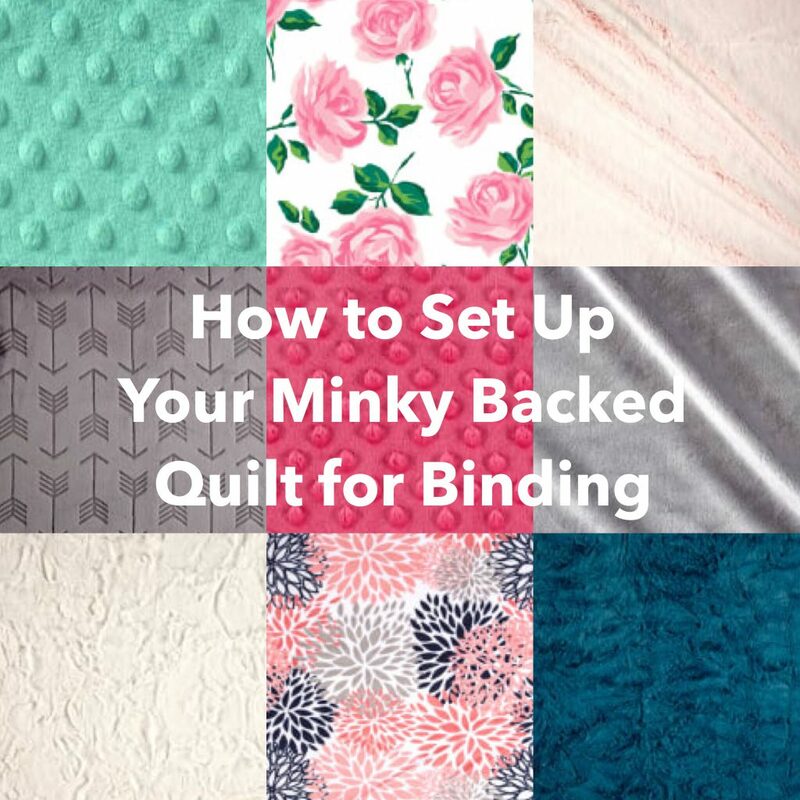 I’ve bound several minky backed quilts in my time, but have never used this approach. I’m definitely tucking this away for future use! Thanks, Jen! Great tutorial. I have done hand sewing on a number of quilts with plush on the back. Not endorsing big box stores, however, their better quality plush hand binds just fine. I’m glad you’ve had a better experience with big box minky than I have. That give me hope that maybe things have changed.